Suffolk Naturalist: KILLER WHALE! I wish. Well that was the news spreading across East Anglia this week after two bird spotters on the north Norfolk coast, saw the large (usually about 7ft) dorsal fin of a Killer Whale break the surface of the North Sea near Cromer Killer whale sighting report. Unfortunately, I was nowhere near Norfolk this week, so no chance of me adding that to my list of species. However, the whale was reported to heading in an easterly direction, so I'll keep the bins to hand when I'm sitting on the port at Felixstowe. Talking of which, again this week I found myself at the far end of the port looking through the bins and the caged fencing for new species and I'm happy to report new species I found!!!! First this week making it's appearance on the list is the Redshank, feeding on the mudflats next to the Shelduck I spotted last week. Wonder if it's the same Shelduck??? Then almost like it felt my disappointment in not seeing what I had hope to see, it suddenly appeared out of nowhere flying 10ft on the other side of the fence. The Little Egret! Over the last few years on my travels I've begun to see more and more of these pure white miniature Heron's, and I feel that this is a sign of climate change in itself as over the last 20 years or so, these birds have moved further and further north and are now an almost common sight in southern England. The next species I spotted was a species I've only ever spotted once before, the Little Owl. I spotted it as I was driving to work and it came swooping down from the darkness to land on its unfortunate prey. So YAY! Another 3 species this week, at this rate I will fail dismally with about 200 species at the end of the year, not good. But, even though it don't feel quite right, I'm beginning to think that spring might have already be underway. Last night in fact, a largish moth hit the windscreen of my truck. Unfortunately, there was nowhere available for me to pull over to collect the remains so I could identify it (I know, I'm beginning to sound desperate). But as far as I know, and please feel free to correct me on this, we only have one species of winter moth in Britain and this moth wasn't that one, it was to big. Time to get my secret weapon completed and ready for action me thinks!! Now those of a fearing nature, especially spiders, look away now. That's because, tonight, I went to go and check on my little furry inpatients (the bats), a little Earwig fell down from above the door, yes, another species. Then that was quickly followed by a nicely patterned Garden Spider, which just hung there. Luckily, I had in my pocket a small vial of just about the right size. I popped the cap off, placed it under the spider and in she popped, bonus! 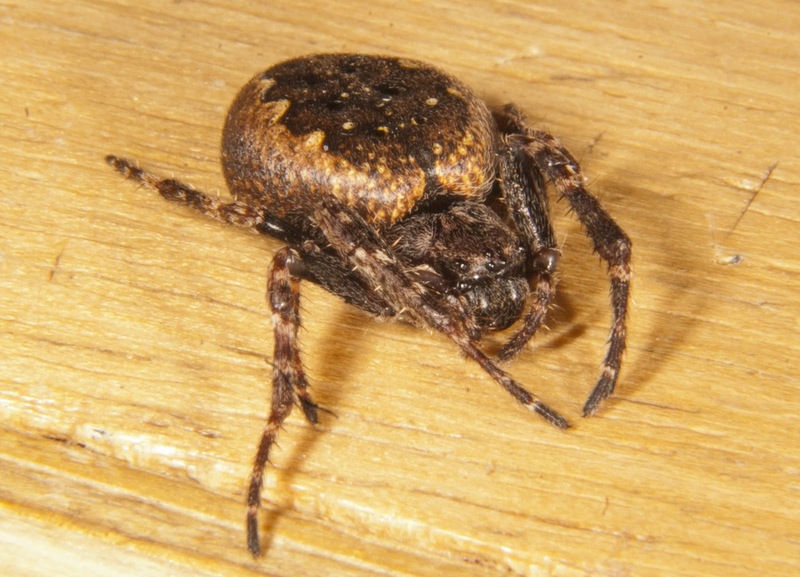 We have many species of Arachnid in the UK and I wanted to make sure I could get the right ID for this one, hence the capturing of said spider. She (apparently, only the females have a particular type of marking on the back) was the perfect model and sat patiently for whilst I snapped away from all angles. As you can see from the following photos, she has some lovely markings and 6 eyes (spiders have between 2-8 eyes). Now I thought that getting the ID spot on for this spider would not be so easy because they (Garden spiders) vary in many ways pattern wise. 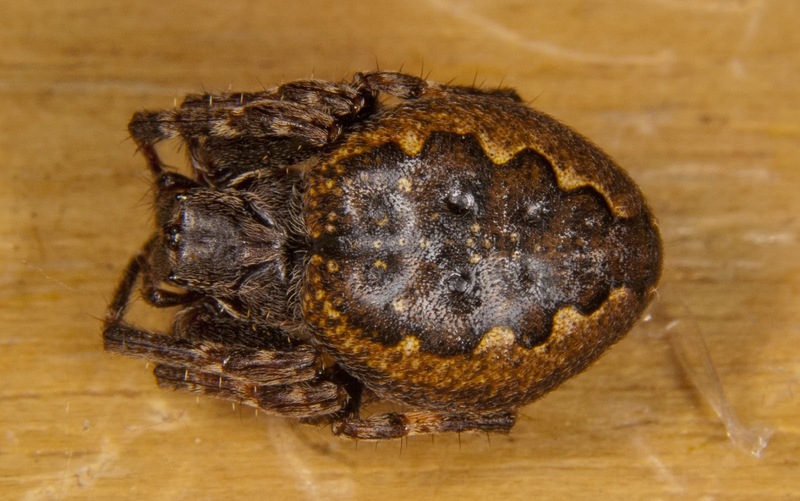 Now The Natural History Museum lists the species as Araneus diadematus, and I thought that they were just being a bit generic about it. 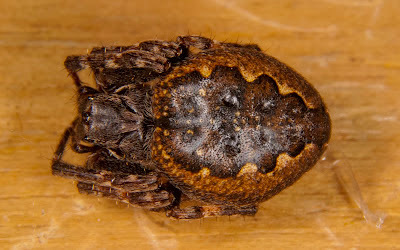 Yet, this fantastic little website The Spiders of North-West Europe (if you have a serious phobia of spiders DON'T GO THERE!) 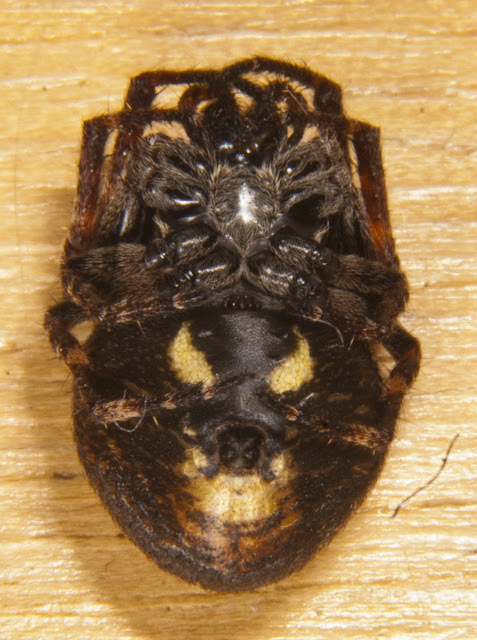 shows many photos of this species and you will see the differences in the Family Araneidae. Then I noticed a little bit of text under the many pictures of various forms of the spider which states "Araneus diadematus can vary a lot in colouring and appearance.". So, here are some pictures of my little specimen (which has now been released back to the same spot I found it).